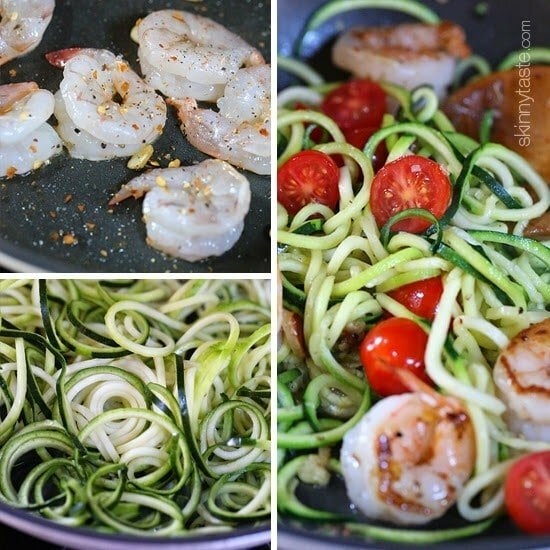 Spicy shrimp with garlic, zucchini noodles (zoodles), tomatoes and a squeeze of lemon – I just inhaled this EASY low-carb, gluten-free, paleo-friendly dish for lunch which took less than 20 minutes to make, start to finish and it was DELICIOUS! I love a good spiralized veggie dish once the weather starts getting warmer. A few of my favorites are Shrimp Zoodles Parmesan, Quick Spiralized Zucchini and Grape Tomatoes, and Shrimp Scampi Zoodles. Today it’s finally starting to feel like Spring! Before you know it, summer will be here and you know what that means…. bathing suit season! I’ve been diligent about working out a few times a week, but you know what they say – great abs start in the kitchen and this so true so now that winter is over, I’ve been cutting back on my carbs (not eliminating, don’t worry!) and really making my calories count. 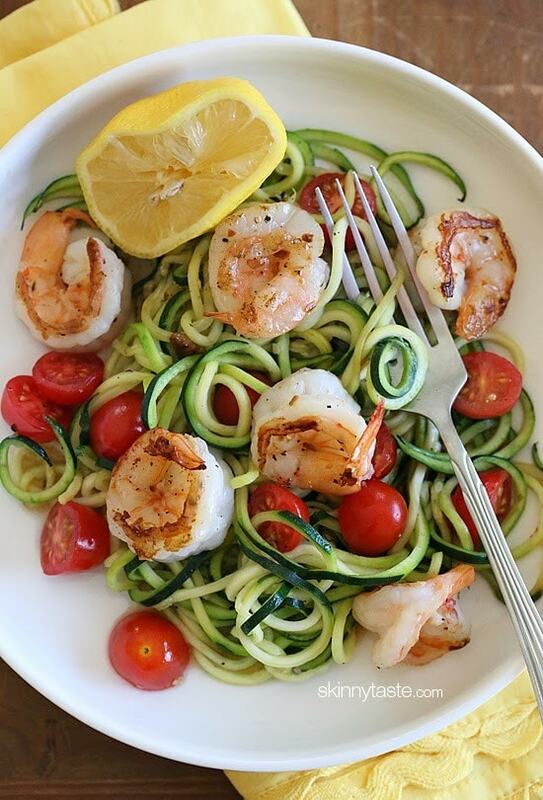 In this dish, rather than using pasta, I swapped it for zucchini noodles. My Paderno Spiral Vegetable Slicer is my all time FAVORITE cooking gadget. 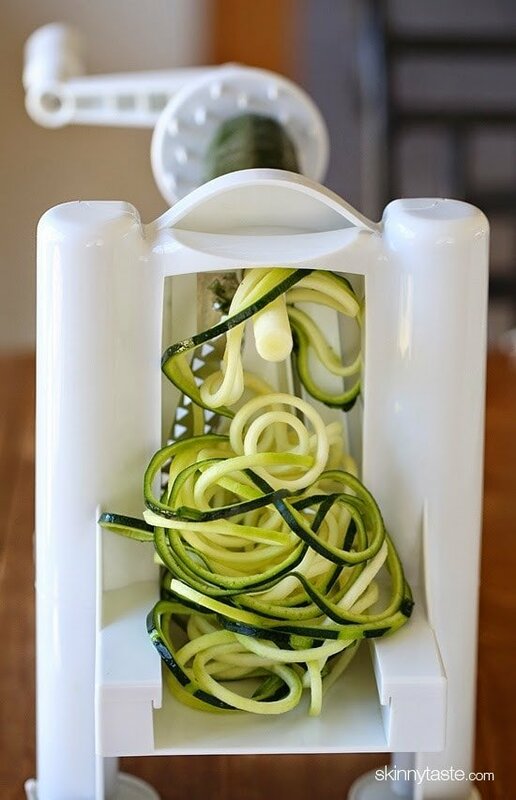 It’s the easiest way to make zucchini noodles, sweet potato spirals, carrot ribbons and more! Prior to owning one, I used my mandolin but it’s so much quicker and easier (and safer) with this fun gadget – you NEED one!! Add 1 teaspoon of the oil and crush red pepper flakes, add the shrimp and season with pinch salt and pepper; cook 2 to 3 minutes. Add half of the garlic and continue cooking 1 more minute, or until the shrimp is cooked through and opaque. Set aside on a dish. Add the remaining 1/2 teaspoon oil and garlic to the pan, cook 30 seconds then add the zucchini noodles and cook 1 1/2 minutes. Add the shrimp and tomatoes to the pan and squeeze the lemon over the dish.